This recipe is my favorite way to prepare asparagus. With just a little olive oil, 3 cloves of garlic, and a 1/4 cup of Parmesan cheese, you can turn ordinary asparagus into extraordinary. Asparagus is one of those vegetables that’s really easy to make in the oven. All you need to do is rinse and trim some fresh asparagus, put it in a a Ziploc bag with the fresh garlic, and a little salt and pepper. The lay it out on a baking sheet (lined with parchment paper for easy cleanup), sprinkle on some grated or shredded Parmesan cheese and put it in the oven for 10 minutes. This method is not only perfect for a weeknight meal, but it’s especially perfect if you’re cooking for an event or party. The compliments you will get for this dish will be plenty! Rinse the asparagus cut off the woody stems. Dry with paper towels. Put olive oil in a Ziplock bag and add asparagus. Now add minced garlic, salt and pepper. Toss it all together in the bag so that all the asparagus is evenly coated. 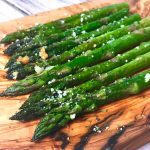 Layout asparagus in a single layer on a baking sheet lined with parchment paper. Sprinkle with Parmesan cheese and bake for 10 minutes.